Many people interested in adopting a bird may already have one or more parrots. That was certainly the case for us. My husband fell in love with a Meyer’s parrot named Virgil during a visit to the Phoenix Landing adoption center in Asheville, NC. We already had two Pionus parrots and a Senegal, and the flock hadn’t grown since 2006. We were nervous about introducing a new bird to our existing flock, but decided to foster Virgil and give it a try. After the quarantine period, we started introducing Virgil to the flock. We made a few mistakes. We decided to simply bring him to the living room with another flock member to see what happened. This might work for some birds, but it did not work in this instance. During our first two attempts to introduce Virgil to another bird, he flew directly to the other bird and tried to land on them. The other birds were not keen on this at all, and flew out of the room. We recognized that this particular approach was not working. So, we took a step backwards and developed a plan to introduce them more slowly, breaking down the process into smaller steps. Defining our goals: What behaviors did we want to encourage? We discussed what our ultimate goal was, behavior-wise, for the birds. The three birds we already had were able to socialize in the living room with us in the evenings peacefully. They explored separate play stands or stood on one of our knees, played with toys, and preened. We decided our goal was to have Virgil engage in similar behaviors in the living room at the same time. We wanted to reward him for remaining on a play stand or person, playing with toys, preening, or interacting with us. The behavior we did not want to encourage was him flying to the other birds. Clipping wings is a controversial topic among parrot owners, but we decided to clip Virgil’s wings during this transition period to slow him down if he decided to fly to another bird. We felt it would help in creating a history of positive experiences with him for the other birds, and we wanted all birds involved to have just that – positive experiences. Virgil receives treats from inside his cage while two of the other birds wait their turn. Now that we had our final goal established, we decided a good step toward that was to reward Virgil and the other birds for simply seeing one another and remaining calm. We decided that “calm” in this instance meant standing where they were, and not moving to get closer to or further away from one another. Body language would also be important. For the first step, we wanted Virgil to sit on a perch inside his cage with his door closed while the other birds were in the room nearby. I had the other birds perch on me as I sat in front of Virgil’s cage. This went very smoothly. Every night for an entire week, I spent time sitting in front of Virgil’s cage with each of the other birds (sometimes two at a time), giving him a treat, and giving them a treat for simply being around one another and looking in one another’s direction. If there was any lunging, they would not get a treat. I never once had to deny them a treat, as everyone remained calm and focused on earning those treats. For the next step, we wanted to Virgil to be in the same room with the birds for a very short period of time. Our plan was to reward them being in the same room and remaining calm for just a few seconds, and then gradually increase the amount of time they were in the same room. Virgil was brought into the room on the hand of his preferred person (my husband) while the other three birds were out. Everyone stayed where they were, and they all received a treat for doing so. Virgil was then removed from the room. He was brought back again a few minutes later. Everyone remained calm and stayed where they were, so they all received treats again. Because everyone continued to remain calm, we were able to quickly increase the amount of time he was out in the room with everyone else, rewarding all the birds every few minutes with treats for perching, preening, playing with a toy, or doing any of our desired behaviors. If anyone started to shift their weight forward, pull their feathers tight, or flutter their wings to signify that they were interested in flying to Virgil, or if Virgil signified he was interested in flying to another bird, no treats were delivered to that bird. Once their attention was redirected towards a toy or person again, they were rewarded with treats. We expected it to take a week or more to be able to have all the birds in the same room at the same time for as long as an hour. It actually only took us a weekend before we could have them out in the same room for an hour. Virgil (far right) is now able to stand on one foot, relaxed, while two of the other flock members are near. A few months have passed, and we are still able to have all birds out in the living room in the evening at the same time. Treats are always kept nearby, as we continue to reward them periodically for the desired behaviors of playing with toys, interacting with us, or being near one another in a positive manner. We want these behaviors to continue, so we continue to reward them. This series of steps worked for us nicely. We recognize that it may not work for everyone, as behavior is always a study of one. However, developing and implementing our Plan B resulted in the successful introduction of Virgil to the rest of the flock. I hope sharing what worked for us, as well as what didn’t, might help someone else create a plan that will help them successfully introduce a new bird to their flock. Others have also had positive experiences introducing new flock members. What worked for you? Please feel free to share tips that worked for your flock in a comment or on the Phoenix Landing Yahoo Group, especially if you used positive reinforcement. Phoenix Landing hosts a number of parrot behavior workshops throughout the year. 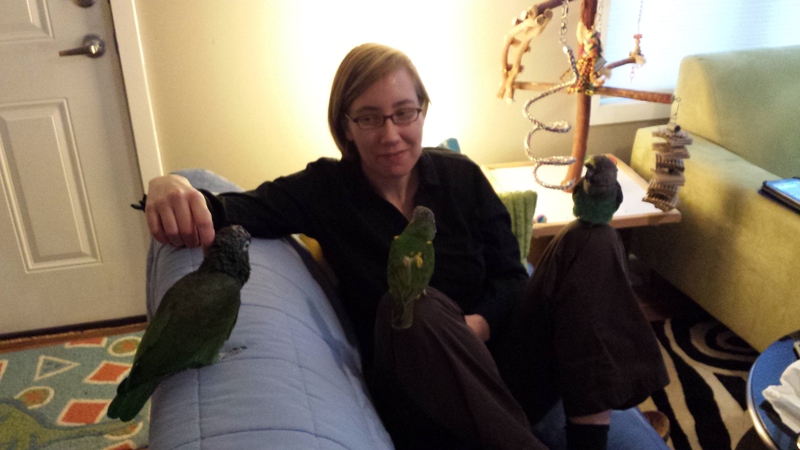 Last month, we re-presented “Clicker Training for Parrots” in Northern Virginia. 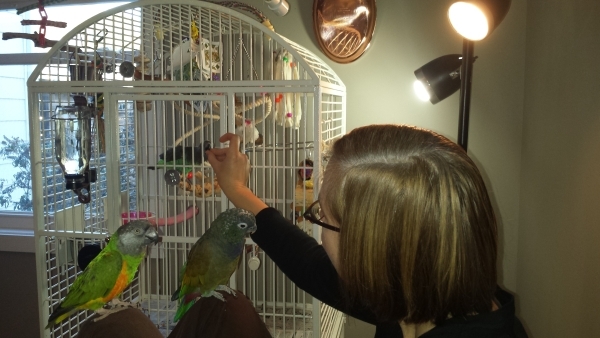 Clicker training is a fun way to interact with your bird, but it’s also a useful tool for addressing behavioral issues. Our September class provided an introduction to the principles of operant conditioning and, specifically, how it applies to our interactions with our birds. In addition to explaining how clicker training works, ideas for getting started, and strategies for overcoming training challenges, the class also focused on interactive learning with hands-on exercises designed to let participants work on clicker timing and shaping behaviors. Below are the slides from the workshop. Once you apply the principles of clicker training to your daily interactions — regardless of your bird’s age or previous training — you will be amazed at how effectively you will be able to communicate with each other, how much faster you will build trust, and how quickly your parrot will learn tricks that delight and amaze. To learn more about how you can build a more positive and fun relationship with your birds, please check the Phoenix Landing events calendar for upcoming classes.